Flippa is overall a great website. Modern and friendly design, good user experience, good font and nice color combination, great overall readability. 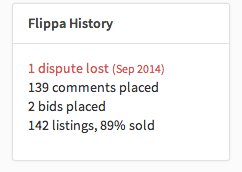 However if you are an active seller on Flippa, you might have noticed some annoying features or even bugs. Being a web developer myself, I do know how easily bugs can happen, but I also know that they can be fixed. I also know what it takes to create a good user experience on a website and it’s not always easy. Having worked in quality assurance as well, I tend to be more easily annoyed by bugs and silly features. So, here is a list of the most annoying features and bugs that I have encountered over the years or that were reported to me by fellow sellers and buyers. Many of these bugs have been reported to Flippa by myself and I often get a feedback from the support that they are looking into this, unfortunately very little has ever changed and sometimes the support calls it a “feature and not a bug”, which is clearly rubbish. For these reasons I decided to keep some kind of journal of the bugs and silly features, in hopes that one day Flippa pays more attention to this, as some of them lead to unsold auctions. I try to keep this list as updated as possible. The last time I verified these bugs was early September 2014. Note: I tried to sort the bugs by their severity, meaning that bugs or features that actually caused me to lose out on an auction or cause me severe headaches, are listed higher, while cosmetic and other smaller bugs are listed at the end of the list. Okay, this one I have reported and if one day I should go bald, I know exactly why. Every now and then Flippa makes an update to their website. In or around August 2014 they made an update which affected the Dashboard and the overview of all the listings of a seller. Before, all listings were nicely ordered by expiration date. Meaning, active listings are on top, and below the expired (sold and unsold) listing would be listed by the latest expiration date. This way I would have a perfect overview of all my active and expired auctions. However with the last update, they changed the order of the listings to use the date of creation, rather than the expiration date. In July and August, I was very actively selling on Flippa, selling over 40 websites in 30 days. Because I sometimes create drafts weeks before I list them, and some listings I have up for 3 days, other for 10 days other for 30 days, I suddenly had a complete and chaotic overview inside of my dashboard. On the very top of my listing it would show sold listings from July, below it it showed unsold listings from last week, below that it showed sold listings from yesterday, on page 2 is showed active listings and listings expiring within the next few hours. It is an absolute headache to keep an overview. I had to manually create an excel sheet just so I knew which listings were sold, which I had to relist. I contacted support and I was told they are looking into this. It has been 2 months now and still no change. If I ever make 40 listings again over the course of 30 days, which I am planning on doing in November, I might actually go on a rampage and pull all my hair out. And no, don’t give me the excuse, about receiving email notifications. 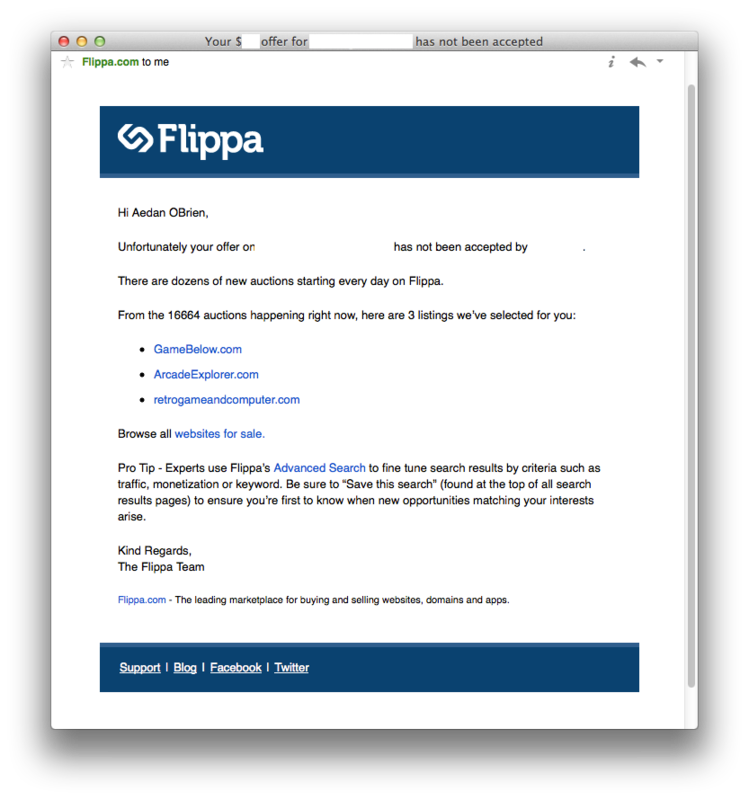 During my active periods on Flippa, I receive about 100 emails per day from Flippa. There is no way to keep them organized. Ouch! If you are an active seller that sells 30 or more auctions within 30 days, you know what I am talking about. In general, Flippas website offers a very smooth user experience. It is beyond me why Flippa made this change inside of the Dashboard. It just causes so much confusion, time is being wasted and sellers who sell a lot will simply go crazy over this mess. I also don’t understand why it would take Flippa so long to fix something like this. It was reported by myself in July or August 2014. Being a web developer myself, I know this kind of adjustment requires very little work. Please let the user sort the column by themselves, or at least revert so the default sorting option… by expiration date. I never paid much attention to this, until 2 listings went unsold, because of this issue. To find all this information, Flippa uses a 3rd party called http://builtwith.com/. BuiltWith offers an API that searches for such information of any given website. So now to the problem. About 10% – 20% of my listings show ASP.NET as my platform, although it’s based on WordPress and PHP. The problem with ASP.NET is, that it only runs on Windows servers, and Windows servers tend to be a lot more expensive than regular Linux servers. Plus installing WordPress on a windows server is not always that easy. 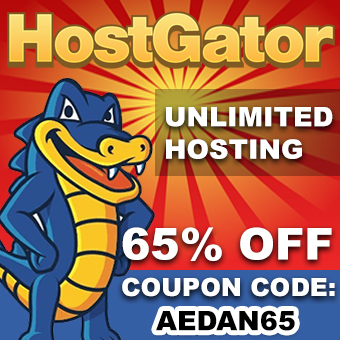 I actually had potential buyers, who backed out, because they saw “ASP.NET” and informed me that they can’t afford windows hosting or they are looking for websites that are only WordPress based. Even though I tried to explain to the buyers that this is an error, they have already moved on and purchased a website from a competitor. My main issue is that when you hover over the platform, Flippa shows some information and says “This information is green, because it has been verified”. I have to be blunt here Flippa, this is 100% false information. As explained, Flippa uses http://builtwith.com/ to gather those information, and I have contacted BuiltWith and they have told me that non of their data is verified and shoud never be 100% relied on. The way BuiltWith works, is that they look for server signals and based on those server signals, they make their best guess, to identify CMS, frameworks and programming languages. So why the heck does Flippa say in bold, that this information is verified, when it’s clearly a best guess by a 3rd party? But why does this error occur in the first place? It’s very simple, when I register a domain name, I might register them days or weeks before selling them. During that time, the domain is parked with GoDaddy. The guys over at BuiltWith obviously recognize GoDaddy parking as ASP.NET, which might be correct, but once I create the listing, the database from BuiltWith, where Flippa gets the information from, might get a cached version. I contacted BuiltWith and they say in some cases, domain information are cached for up to a month! In other words, Flippa is fetching data that is outdated since a month. This is a big no no! Flippa, please don’t claim to have verified information, while it’s actually a “best guess”. First off, change the hover description! Don’t claim it’s verified, when your API provider clearly states “best guess” and uses a database that caches up to 30 days. Let sellers pick the platform manually. Every website owner knows if his website is WordPress based, uses another CMS or use a custom script in PHP or ASP.NET. There is absolutely no need to have this data be fetched automatically, which constantly leads to inaccurate information. Severity: High (At least 5 auctions of mine went unsold last month because of this issue). When creating the listing, you can set a start price of $50 as well as a reserve price of $50. This way, the first bid can win, just the way I like it for my turnkey websites. The problem starts once the listing is live. If I set the start price and reserve price to $80 and after a few days I have not received a bid and I feel like lowering the price to $50 (starting price and reserve price), however the system doesn’t allow me to set the starting price the same at the reserve price once the listing is live. It tells me the reserve price has to be higher than the current starting price. So I have to make $50 start and $51 reserve. Now it gets even worse, and I am actually talking about first hand experience. I receive a bid of $50, but the reserve price has not been met, although I am more than happy to sell the site to the guy for $50. No more bids occur, the auction ends unsold. I try to contact the buyer via post offer auction, letting him know I am happy to sell it for $50, but he doesn’t respond. I have lost out on 5 auctions because of that silly system that doesn’t allow me to set the reserve and starting price to the same once the listing is live. Fix the system so it allows to set the reserve price the same as the starting price during a live listing, especially if there are no bids. Sellers that are actively selling start up websites, will list anything from 3-12 websites per week. I sell about 80% of all my listings. Sometimes I don’t relist the unsold listings straight away. I prefer to wait a few days or a week. After several weeks the unsold listings start to accumulate, and I have no easy way to find all unsold listings. I have to go through all my listings to see which ones went unsold. On top of that, it sometimes happens that you have to relist an auction multiple times until it sells. In your listing overview, you will then have all copies displayed of that listing, and because the listings are not sorted by expiration date, but by listing ID (based on when you created the first draft), it’s a huge mess. What happened to me several times, is that on page 1, it displayed the older unsold listing, but on page 2 it shows the relisted and active listing of that auction (because of the sorting issue that I explained above in the section Chaotic Listing Overview in Dashboard). Meaning that I almost relisted a website that is already active, just because I have multiple copies of the same auction, and thanks to the sorting system of listings inside the dashboard, it can happen that newer and active listings are displayed on page 2. Inside the dashboard, be able to display all unsold listing. And if a listing has been listed multiple times and one of those relist was sold successfully, show some kind of message, or don’t list them inside the unsold listings. This bug is without a doubt the number 1 cause for me needing to contact Flippa support. Many sellers use CamelCase in their listing for the URL to make it easier for the reader to distinguish multiple words inside a domain name. I have noticed it myself, listings where I use CamelCase, sell better than ones where I have it all lowercase, especially when the domain name consists of 3 words or more. So what’s the issue? The problem is that when you type in the URL while creating the listing, it sometimes reverts back to all lowercase. This happens in about 3-4 listings out of 10. I’ve created dozens of listings and I could not find any rhyme or reason on when or why it reverts back. While creating the listing, there are multiple steps you have until you launch the listing. Each time you hit save to get to the next step, there is a chance it reverts back the URL to all lowercase. Most annoying is that it sometimes happens after you make the payment and if you don’t pay attention then and hit the “Launch Listing Now” button, then there is no way to change it, unless you contact Flippa support and have them manually change the URL to make use of CamelCase. I have noticed this bug since 2013 and I have reported it several times. Almost every time I am told they are working on this issue. In an email from 3. August 2014, I actually received a response from Support stating that this is not a bug, but a feature that it automatically makes all lowercase because Flippa wants no more CamelCase, so they keep a uniformed marketplace. Wait what? For 1 year they are telling me it’s a bug that they are working on, and now it’s a feature? I don’t see why Flippa doesn’t want CamelCase, since it helps with the sales and it makes it much easier for potential buyers to read the domain name. I think their support might have been misinformed on this one, since to this very day, more than half of all listings make use of CamelCase. But even if it’s a feature, then that simply means their system is broken in a reverse way, because this only happen about 30% of the time where it reverse to lowercase, in other words 70% of the time it doesn’t reverse to all lowercase. Either way, something is wrong and has been wrong for over a year. Not the end of the world, but very annoying that in about 30% of all listings this bug appears and if you don’t pay close attention, then you will have to contact Flippa Support to change the domain name to CamelCase. Their support is usually very fast in doing this, so not much time is lost. It would save a lot of time if this would finally work as intended… by not changing from CamelCase to lowercase. Severity: Medium (for mass sellers), Low for regular buyers & sellers. This is something I noticed since 2011 and I find it very confusing and misleading. In the overview of your private messages, there is a column that clearly states “Received”, and below it the time on how many hours or days ago you received the message. All the messages are sorted by newest received date. If you paid close attention, then you might have noticed that when you send a message to someone, the “Received” time also gets updated and on top of that, once the receiver of the message reads that message, the “Received” time is updated again. Okay, I don’t mind that the date gets updated when sending a message. This is quite handy, so I can see my latest answers are on top of the list. However, the problem or to be more exact, the confusion starts when the date of the message gets updated when the receiver reads the email. Here is an example. I send a message to a person, he doesn’t read it for 4 days. During that 4 days I receive 20 messages from other people. Then on the 4th day, that person reads the message, and suddenly that old message is on top of my list, showing me a “Received” date of a few hours ago (the time where the other person actually read the message). Very often I was confused on why this message would show on top with a new date and I went through the message without actually seeing any new conversation. This is just a very strange system. Why list messages on top of my list when the receiver reads the message? This is so confusing when you have get 10-20 messages daily. Out of nowhere old messages are listed on top for no apparent reason. It would be more organized to simply make an additional column, where it states that the person has read the message, or even inside of the messages, show a little note, saying “receiver has read this message”. The messaging system should be sorted by last send/received message and not by last read. Unfortunately I have lost a dispute as explained here (and I’m still insisting that this was a very unfair move from the other guy, but that’s another story). A lost dispute is permanently marked in someones profile, but what is really annoying is that is shows the wrong date. Not only is the date wrong, but it constantly shows the current month and year, making it look like I have just received that irreversible stain on my profile. Why is it bad that it show the current date? Well, I have lost a dispute back in March 2013, and it my profile it says Dispute lost (August 2014). In August alone I have had 2 people commenting on this dispute, asking what I did wrong to lose a dispute. 1 guy actually backed out of a potential offer, as he said he doesn’t feel comfortable buying from someone who has JUST received a dispute. Displaying the wrong date is misleading, especially if it’s constantly the current date. Simply fix the date and display the date when the dispute actually occurred. As a seller I have to be in constant contact with my buyers. Flippa recommends to use their private messaging system, this way if something goes wrong, such as disagreements between buyer and seller, Flippa support can easily double check and verify themselves. This is a very good solution in theory, however the messaging system is currently so basic, that it’s almost impossible to offer customers a good support experience. At first I tried using the system, but very soon I ran into several issues, so I signed up with http://www.helpscout.net/ so that I can offer professional support and keep an overview of all open support issues. Downside is obviously that if it ever comes to a disagreement between buyer and seller, Flippa has no 100% guarantee of whose word to take. So what are the issues with Flippas private messaging system? Private Messages sorted by last viewed, not by receiving date. Definitely the worst issue to keep any form of overview. This issue is so big, I created a separate article about it. The message itself doesn’t allow for any sort of formatting. No lists, no bold, no linking. I get that Flippa wants to keep the messaging system secure, but by not allowing direct links, they don’t really prevent sending links, all they do is make a huge hassle for my customers to copy & paste links. This is a perfect example of false security. People abusing the system by sending out spam still manage to do so, and users who really need to create links can’t do so. Doesn’t tell me if the user has read the message. I small note below my last message, saying the receiver has read the message would be very helpful. Being able to archive messages would help a lot, especially when offering post sale support. Basically, if Flippa asks users to use their message as part of communication between buyer and seller, please make it a bit more state of the art. Every basic Forum has a more advanced system. Nothing major, but it can cause quite the confusion. When creating a listing, you head to checkout, make the payment and then select to schedule the listing to start in a few hours, the listing does not appear inside of your dashboard. It completely disappears until the time it goes live. So if you closed the window and realize you have to edit the listing before it goes live, the only way to find the auction is by looking up your browser history. This is very confusing, especially if you schedule multiple listings. You have to manually create a list in a spreadsheet, just to keep an overview. Not being able to see schedule listings for hours or days, can make users think they have made something wrong and might relist the website. Simply displaying them in the dashboard with the time until it gets launched would solve a lot of problems. Update: Finally after 3 years my list from almost 10 counties is down to 2 countries. I am not sure if Flippa made changes, or if the expiration date is actually 2 years. Okay, first off, I am all about transparency and I think it’s great that this information is publicly available. On every profile it says where the user is from, as well as where the user has recently logged in from. What is very misleading, is that the line clearly says “recently”. I travel a lot, especially around Europe, usually a every 1-2 months. In 2011 I was in Ireland, Switzerland, Germany, Poland, Thailand, Spain, England, Canada and USA. In 2012 I was in Ireland, Switzerland, Germany, Austria, Italy, Greece, UK. When I’m on the go and I have active auctions, I obviously log into Flippa while traveling. I noticed that over time my “Recently logged in from” just kept getting bigger and in February 2013 I noticed it still shows that I have recently been logged in from Poland, Thailand etc, which was over 2 years ago, which can hardly be called “recently”. As I said, I am all for transparency, but this is very misleading. Listing all the countries I ever logged in from, even more than 2 years later, has no benefit towards transparency. I just makes buyer paranoid. Oh and here’s a fun fact. If you log into Flippa from your home country and upon login you check to automatically be logged in for each visit (which sets a browser cookie), you can travel around the world with that device, and for as long as you don’t delete your cookies and automatically get logged in, Flippas system doesn’t recognize this as a “new country”. In 2014 I travelled with my same laptop through Asia, and I noticed that no new countries were added, apart from the one actual login where I had to enter username & password, while I was in Switzerland. Displaying all countries a user has ever logged in from over several years is misleading and it also doesn’t match the sentence “Recently logged in from”. Only display countries from the past 3 months. Unfortunately every now and then it happens that you get a bid on a website, wins the auction and then the buyer realizes, he can’t actually make the payment. Okay, it’s not an ideal situation, and no seller likes to hear that the winner of the auction can’t afford the website he technically purchased. But hands down to those buyers who actually contact me and tell me straight forward that they can’t make the payment, because there are so many buyers who just cut off contact if they can’t or don’t want to make the payment. The problem is, if this happens, you will want to get your listing fees back and the success fees. To do this, you have to do a dispute, and a dispute can only be done once 72 hours passed from the time the auction ended. Once the dispute is made, I have to wait another 72 hours until Flippa makes a decision. This whole dispute system is absolutely unnecessary for a situation like this, where a buyer clearly says on day 1 or sometimes even before the auction ended, that he can’t make the payment. Why let me as a buyer wait a week until I can relist the website, when it’s already clear that no payment will be made? Flippa needs to have a better system for when there is a mutual agreement between both parties that no payment will be made, so that the seller can relist the website immediately. Needing to wait almost a week, when it’s 100% clear that the seller can’t pay, is a waste of time for everyone. Make a special option for when the seller clearly says he can’t wait, so that the buyer can relist his website within a few hours, rather than 6 days. Not much to say here, apart from sellers that sell actively on Flippa and get lots of messages, 10 messages per page is not enough. It’s very hard to stay organized if I have to switch between pages to look for messages that I have just received over the past few hours. Please increase the amount of messages displayed per page to 20-30, or give active sellers an option to change the amount within their profile. This bug here is nothing major. I would not even consider this one a real bug, but it’s very confusing to explain. So, let me try to explain this. As a seller, when your listing goes unsold, and you are making a post auction offer to potential buyers (watchers) and they decline the offer, I (the seller) receive an email saying the offer has been rejected. However the email template that is being sent to me, is the exact same one that a buyer would receive when his offer is declined. The problem with that email template is, that it tells me, not to worry about the declined off and then it lists many other website where I can make a bid on. I am the seller, not the buyer, I don’t need to receive an email where it tells me where I can make bids on my competitors websites. Nothing major. I’m sure almost no one has ever noticed this, nor reported it, as it’s just a wrong email template that is being sent out to sellers that have their post offers declined. Create a template that actually makes sense for sellers that got their offers declined. This is something that has been around since I joined Flippa in 2011 and it can lead to some major headache. Flippa is based in Melbourne, Australia, so it’s understandable that they use Australian time, AEST to be exact (Australian Eastern Standard Time). Most modern websites have automated time adjustment. Inside your profile, you can choose your timezone, and all the time throughout the entire website, will be converted to your time zone. Flippa however, seems to not be able to find a system that works for them. Since I joined Flippa, there are multiple timezones displays and way of displaying dates and times. On profile page, when hovering over the “Member since”, it shows the time & date in UTC (Coordinated Universal Time). When browsing the listings categories, hovering over the time, it shows UTC as well. Newsletter emails state PST (Pacific Time Zone), such as “No listing fee ends 11:59pm PST”. As you can see, every part of Flippa uses a different timezone. From EST in public comments, to AEST in private messages, to UTC in listings and PST in Newsletters. It’s not a deal breaker, but it’s confusing an unprofessional to have 5 different timezones across 1 system. Just like almost every community based website, let the user in his/her profile set their timezone of choice and convert all dates & times accordingly. Update: I have not verified this big since May 2014, so I am not sure if this still occurs. Severity: Low, but potential privacy issue. Okay this is a weird one and it gave me some headache at first until I figured it out. As a seller, you have the option to use Flippa Deal Flow. Around May 2014 I submitted a site. A few days later, I suddenly noticed that in regular listing that I sold, in the after sales area where I can communicate with the buyer, on the right side where my name was suppose to be displayed, it showed the domain I submitted to deal flow, rather than my name. I contacted Flippa, but their support was at a loss as well, not knowing why my domain name is being displayed. Later I noticed, that inside my profile my first name and second name were overwritten by the URL of the domain I submitted via deal flow. This is not a major issue, but it does cause some privacy issues, because the domain I submitted to deal flow, was a domain of one of my customers, and now that domain was suddenly visible to anyone who ever purchased a website from me. Update: As of October 2014, this issue seems to be fixed. When creating a listing and you are on the Promote page where you select the cost of your listings and promotion, you cannot click any menu links inside the left navigation. The only way out is to click back in your browser. Nothing major, but sometimes a bit frustrating when you realize you missed something (such as the CamelCase of your domain name disappears), you cannot click any of the sidebar menu links. When on checkout and you are considering upgrading your listing, have a look at the prices. Selecting the “Stand Out” promotion package is actually $1 more expensive than selecting the upgrade package “Be Bold” for $19 and the individual addon “Show my Screenshot in search results” for $29. Or you can combine another package with an individual addon. That being said, I don’t think this needs much explanation on why or how this should be fixed.